Critical Appreciation for " THE SONG OF WANDERING AGENUS", written by 'W.B. Yeats'. W.B. 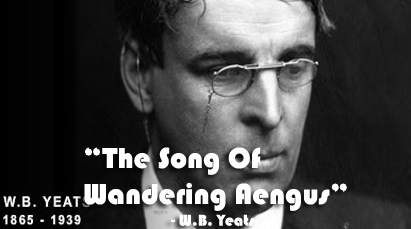 Yeats was an Irish dramatist and poet. He lived very passionate life. The feelings and experiences of his passionate life were transferred into his poetry. His love were with Maud Gonne became the chief subject of his poetry. His poetry of early period came out of that beautiful woman. She become a platonic symbol of all that is beautiful in human being. Aengus is an ancient Irishman who has been taken as a god of poetry in some legends. For Yeats Aengus has a vision of glimmering girl, who is a member of the Irish supernatural world.
" A song of Wandering Aengus " is taken from The wind Among The Reeds. The poet brings legendary figure to talk about his love. His passion ( संवेग ) for Maud Gonne is so intense ( तीव्र ) that it haunts him regularly. She comes to his mind frequently which he faithfully transfers into his poetry. A " fire " in Aengus's head drives him into jungle. He goes there and starts fishing in the twilight of down among the twinkling stars and flying moths. After he caught the fish sudden miracle takes place. This fish is transferred to be a "glimmering girl" to call his name out. The girl ran and faded out instantly through the brightening air. This is all the product of his unconscious desire and imagination. He wandered throughout his life with the hope of finding her but all in vain. This is what happens in his real life situation. He could not marry Maud Gonne and remained thirsty life long. So, the poem expresses a quest for the impossible and unattainable ( अप्राप्य ). Aengus's unsatisfied love with the glimmering girl is symbolic and is related to Yeats's own experience. The poem is very sweet and finely tuned. The images he uses in the poem are all related to light and flower. White and bright symbolize the purity whereas the golden apples of the sun symbolize beauty and immortality ( अमरता ) together. Class 12 Course "The Song Of Wandering Aengus"
Critical Appreciation Of "The Song Of Wandering Aengus"
0 Response to "The Song Of Wandering Aengus | Critical Appreciation"